_England's Community Forests were initiated by the Countryside Commission in 1989. They were set up with the help of local communities to create and maintain well-wooded landscapes, provide green spaces around our towns for recreation and sport, provide habitat for wildlife, make outdoor classrooms for environmental education and much more. _Greenwood Community Forest - This term refers to the physical land that’s out there, of which Bestwood Country Park is a part. The GCF aims to transform the local landscape to make it a greener and healthier place to be - on the doorstep of over a million people living in and around the towns of Nottinghamshire. The GCF is developing its rich mix of woodlands, farmlands and open spaces to create a better environment for everyone, for now and future generations. 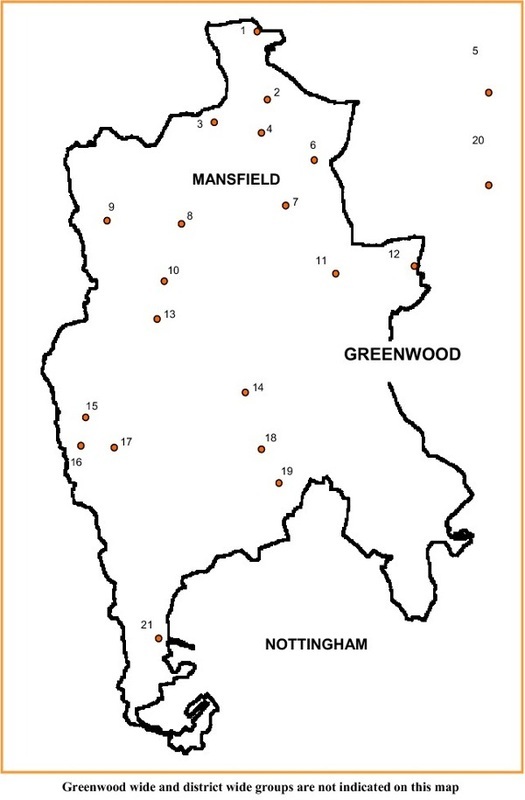 _The Greenwood Community Forest covers 161 square miles of land in west Nottinghamshire. It stretches from Mansfield in the north to Nottingham in the south, from Eastwood in the west to Farnsfield in the east. A map of the Greenwood is displayed on the right-hand side of this page. _The GCF is supported by a practical working partnership - the Greenwood Partnership which acts as an umbrella organisation form several smaller more local groups working within the geographical area of the GCF. The groups involved are identified on the map opposite. Work by groups within the Greenwood Partnership has seen the planting of over 1,300 hectares of new woodland, whilst over 1,000 hectares of woodland has been brought into management and over 1,300 hectares of other non-woodland habitats have been created or brought into better management. _These are the officers appointed by Nottinghamshire County Council to represent their contribution to the Greenwood Partnership. These officers are appointed to encourage "Friends" groups to form and then go on to support them in their aim to improve local woodlands. They also help to increase the local volunteer pool who help in practical conservation tasks. They are now within the general NCC Department of Conservation, along with archaeology and history. They are currently collating the heritage lottery bid for Sherwood Forest Regional Park. This team also compiles the website for Friends of Greenwood Community Forum and a hard copy directory containing details of all the Friends groups involved. _The Friends of Greenwood Community Forum usually meets four times a year. Each local Friends group will send representatives to this forum to bring their ideas to the table and take away some new ideas and information to feed into their group. - Help support the development of new & existing groups through mentoring & advice. _The NCC Greenwood Team helped the Friends of Bestwood Country Park a lot in the early days. They offered practical help such as funding both the venue and the refreshments at our first meeting and giving us a set-up grant. They also offered great support with advice on setting up our constitution and our group's bank account. Along with other NCC teams, they have suffered with the recent cuts but have carried on supporting us despite being over-stretched. Our neighbouring Friends of Moor Pond Wood are members of the Greenwood group. FoBCP hosted one of their events not long ago. Going to other Friends Group's meetings is useful as it gives us chance to talk to other groups, share their good ideas and get their advice based on their experiences. It also helps us to realise that we’re not the only ones fighting to make the most of our park assets on a limited budget. For example the Friends of the Hobbucks helped us with our first Local Improvement Scheme (LIS) application. It is through the Greenwood Partnership that we have input into the Sherwood Forest Regional Park discussions, as they can represent all the member "Friends" groups. The Greenwood group help by publishing guides to the parks in the area. You can download the Bestwood Country Park guide below. This 74 page document is a great reference document for groups working within the Greenwood Community Forest area. A copy can be downloaded below. The Greenwood Team produced a 3 year report covering the years 2007/8 to 2009/10. It sets out how the group has performed against its aims and objectives during that period. A copy of the 12 page document can be downloaded below.